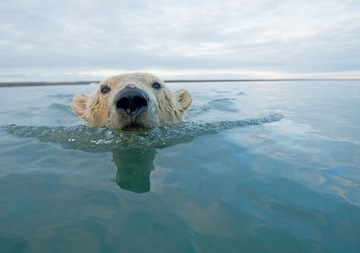 Despite its ample stature, the polar bear (Ursus maritimus, literally Òsea bearÓ in Latin) is built for swimming. Its narrow skull, long neck, and elongated body disguise a hefty layer of blubber, up to four inches thick, which both insulates and buoys. With head held high, the polar bear gracefully swims great distances (50–200 miles), reaching speeds of up to six miles per hour, along the coasts of the circumpolar Arctic Ocean. Below the water, the bear uses its back paws like rudders while moving its front paws in a dog-paddle motion.